Imagine you are a poplar breeder trying to improve poplar varieties for biofuel feedstock. You want them to grow fast and to have high levels of defensive compounds in their leaves and bark to keep pests like insects, voles, and deer at bay. You have 100 seedlings which you have carefully planted in the field and have tended for a full growing season. But you must select only ten that have the traits you want for a second round of testing. The rest get sent to the compost heap. How do you choose which offspring get further testing? Jeff Kallestad, a member of the Advanced Hardwood Biofuels Northwest (AHB) research team who is located at the WSU Puyallup Research and Extension Center, is developing screening tools to help poplar breeders, like AHB partner Greenwood Resources, answer this question. 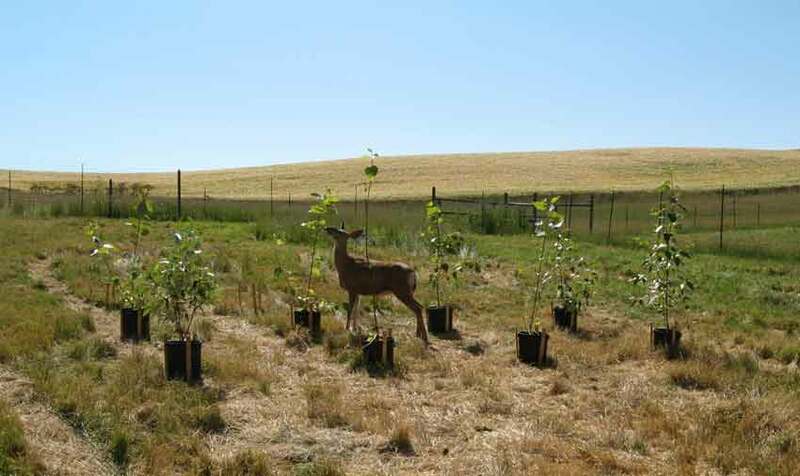 Deer browse on poplars in feeding trials at the WSU wild ungulate facility. Low impact and cost effectiveness are the name of the game given that thousands of acres would be necessary to supply poplar feedstock for a biorefinery. You can’t put a deer fence around that and insect and vole populations can explode in a monoculture, but you can breed for trees that pests find unpalatable. Measuring the defensive compounds in poplar leaves and bark requires specialized skills, chemistry equipment, time, and a lot of money. A cheaper and faster alternative is to use a near infrared (NIR) spectrometer, which uses light waves on the spectrum that humans can’t see to measure properties of chemical compounds at a molecular level. Kallestad is using NIR spectrometry to measure the abundance of condensed tannins and phenolic glycosides, which are chemical defense compounds. He uses complex statistical methods to calibrate the tool for each specific compound found in samples from hybrid poplars. “The NIR spectrometer can be used to measure hundreds of leaf samples in a relatively short period of time, and for relatively little money. That’s where the pay-back comes,” Kallestad said. He is also developing criteria to determine whether pest resistance in the trees is associated with the concentration of a particular defensive compound. In the first two years of the AHB study, Kallestad focused on discovering the abundance and diversity of the unpalatable compounds in a wide range of poplars. 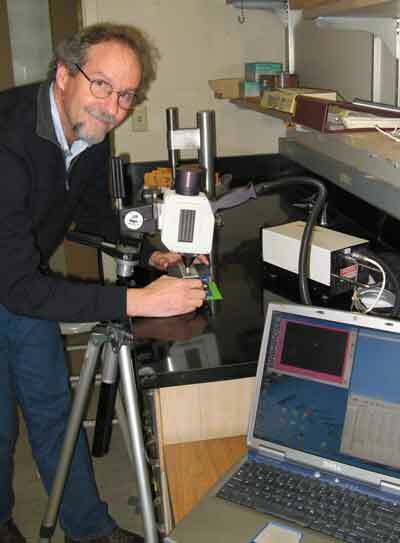 After collecting hundreds of leaf and bark samples for testing, he successfully created NIR spectroscopic calibrations for most of the phenolic compounds. 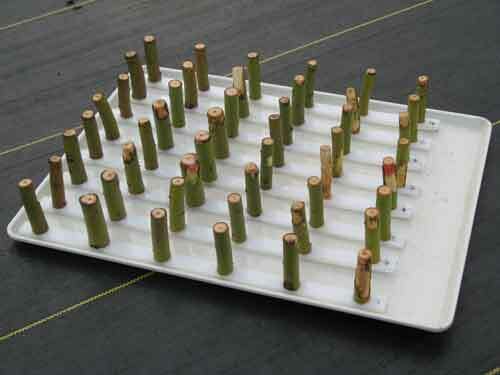 He also did experiments that will help poplar breeders determine the optimal leaf age, position on the plant, and season for harvesting the test samples. So far, studies have affirmed that deer and voles prefer to feed on certain groups of poplar and even on particular clones within a group. However, these studies also show that deer and voles were not particularly averse to samples with the most abundant phenolic glycosides or condensed tannins that were presented to them. In other words, the animals avoided certain varieties but not necessarily because of these particular compounds. Taking a different approach, Kallestad was able to develop a model for predicting the amount of bark the voles would likely consume among different clonal varieties, which would allow breeders to select clones that would be less likely to be eaten by voles. Even though feeding preference or avoidance was not associated with a particular set of known compounds, the NIR spectrometer remains a useful tool for poplar breeders in predicting which clonal varieties voles would most likely prefer to feed on. This year, the third year of the five-year AHB project, Kallestad is focusing on determining whether poplar resistance to insect damage is associated with any of the specific phenolic compounds that can be measured using NIR spectroscopy. Similarly, he plans to see if fungal diseases are associated with the defensive plant compounds. Working with Dr. Posy Busby of the University of Washington, he will also use NIR spectrometry to determine whether inoculating trees with endophytes, which are microbes that live within plant tissues, increases the defense compounds. Ultimately, the NIR spectrometry methods Kallestad is developing will result in tools that poplar breeders can use to determine which seedlings show the most promise for low impact pest control and high yielding feedstock for biofuel production.